This group of birds were bathing and I was able to get some shots from a distance. 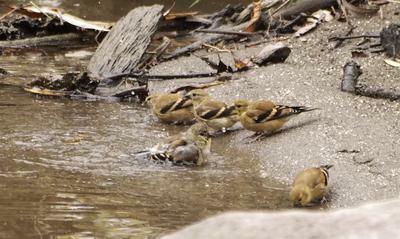 Definitely American Goldfinches in fall plumage. I have these in my area and some of mine are Cedar Waxwings & the other one is the Bohemian Waxwing. I live in Vankleek Hill, Ontario. Thanks everyone for your input. Much appreciated. I wasn't familiar with their winter plumage so a Finch was off my radar. Pamela, they look like American Goldfinches to me. My birder son (age 11) says they are American Goldfinches in fall plumage.